With the Aam Aadmi Party (AAP) resolutely pursuing the Electronic Voting Machine (EVM) tampering issue, the Bharatiya Janata Party (BJP) on 3 April, 2017 took a swing at the former saying that it is over hyping the matter, knowing they will lose the upcoming Municipal Corporation Delhi (MCD) elections and will need a reason to hide behind. Echoing similar opinion as of Election Commission which advised the Aam Aadmi Party (AAP) to introspect the reason of their loss, BJP leader R.P. Singh said that the Delhi Chief Minister Arvind Kejriwal-led party should look for the real causes behind their poor performance in the recently concluded assembly elections, instead of putting the blame of EVMs. "Election Commission has directly said that Aam Aadmi Party should introspect their performance in Punjab and Goa. Because it was the same EVM which made them win 67 seats in Delhi. 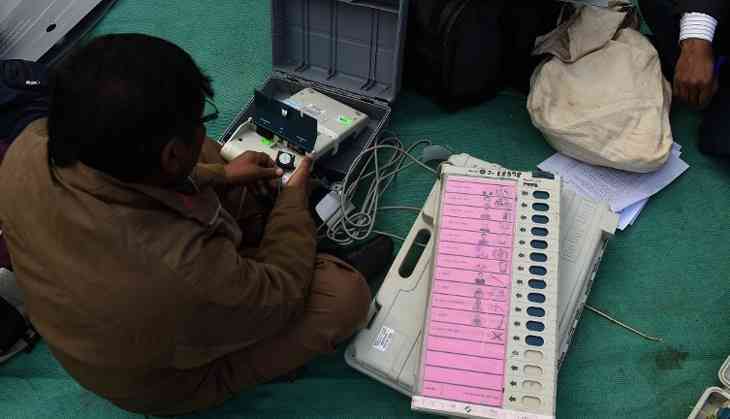 And it is the same EVM which has made Congress party Punjab elections," said Singh. "They should introspect why they lost instead of blaming EVMs. As per me they are preparing for the fourth coming MCD elections, where they know they are going to badly lose and that's why they are trying put blame on the EVMs or elections," he added. In reply to a letter issued by the EC on 2 April, 2017 in which the EC said "it is for AAP to introspect as to why your party could not perform as perform as per your expectations and it is unfair on your part to attribute unsatisfactory poll performance of your party to alleged tamper-ability of EVMS." Meanwhile, the AAP has claimed that the Election Commission has completely failed in its duty to protect the EVMs and the integrity of the election process and therefore failed in fulfilling its constitutional obligation of conducting free and fair elections.